For the past year, Telegram has introduced tons of new features including in-app games, bots, Telegraph and Instant Views, channels, groups and many more. What's going to be a next killer feature? Nobody knows. 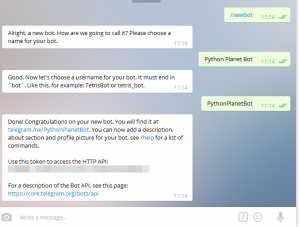 In this humble note I would like to show you how you can create a simple telegram bot using a popular programming language called Python. Bots are great at many things, especially at automating borings tasks. It is up to your imagination what functions your future bot will have, but today we are going to create the one which will communicate with Planet Python, popular Python news aggregator. Bot will simply parse latest content and send it back to you via Telegram. 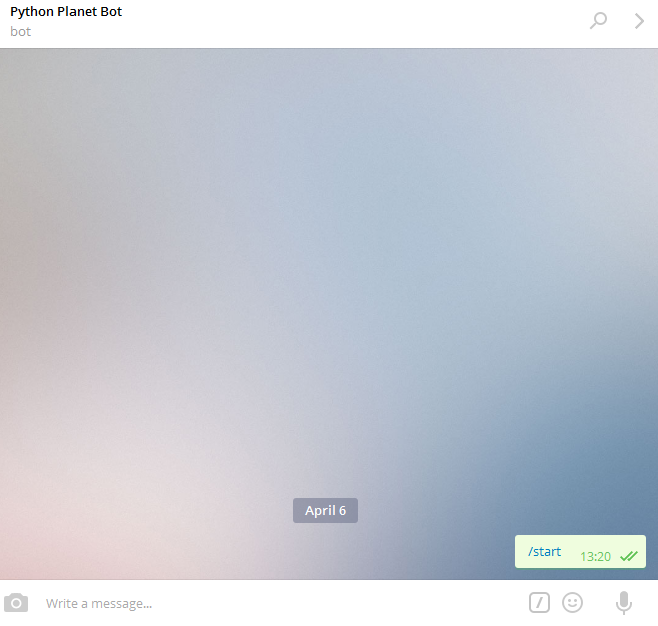 Start a conversation with BotFather by clicking Start button. You will see a command list immediately. In order to create a new telegram bot, you have to type /newbot command and follow the instructions. Be careful, your bot's username has to end with bot. For example, DjangoBot or Django_bot. I decided to choose PlanetPythonBot, which is pretty straightforward considering its functionality. If everything is okay, you will see bot's token or API access key at the end. Hi there! I want you to know that I am writing a book about how to build a Telegram bot. If you want to know more, check out this post. More detailed information about getUpdates and setWebhook are available here and here. The following code show the simplest way to communicate with Telegram API (start python shell for example). You have to replace the value of token variable with your bot's access token. Congratulations! 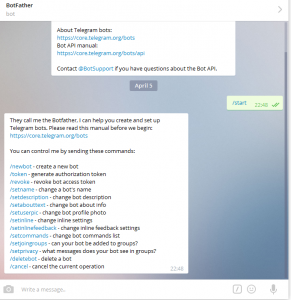 You made your first API call getMe to Telegram which returns information about bot such as its username, bot id etc. Now add your newly created bot to your telegram contact list and start conversation by sending /start. It is enough to know in order to create our telegram bot. 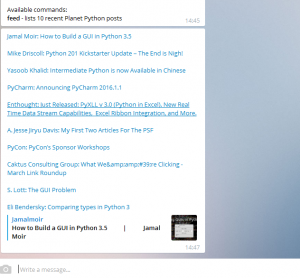 Let's see how django app will look like. CommandReceiveView is where magic happens. It receives POST request and handles it appropriately according to command. Full source code is available here. 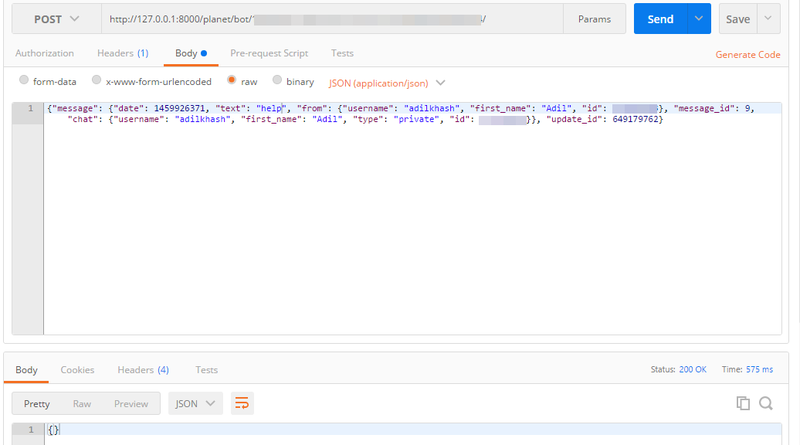 Take a look at a new API call - sendMessage. You can use it when you want to send something back to user by providing chat_id and content. Chat id is a unique identification of conversation between a user and a bot. When you call getUpdates, you see it on every Update object. But Telegram has a restriction on bots which forbids them to send messages to a user if a particular user did not initiate conversation with bot (anti-spam protection). I hope you have already cloned my repo and started django app. Now it is time to test our web app. 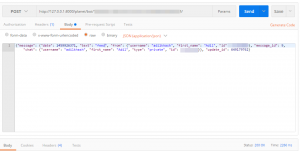 In order to simulate intercommunication between our app and Telegram API service, I will use Chrome extention which is called Postman. Postman is a great tool which helps you test your apps by sending GET/POST/DELETE/PUT etc requests to a particular URL. We are going to send POST request to our CommandReceiveView and see how it is going to handle it. where BOT_TOKEN should be replaced to a given access token key. Let's provide feed command to our POST URL. You can see on screenshots that Telegram bot handled our request correctly. 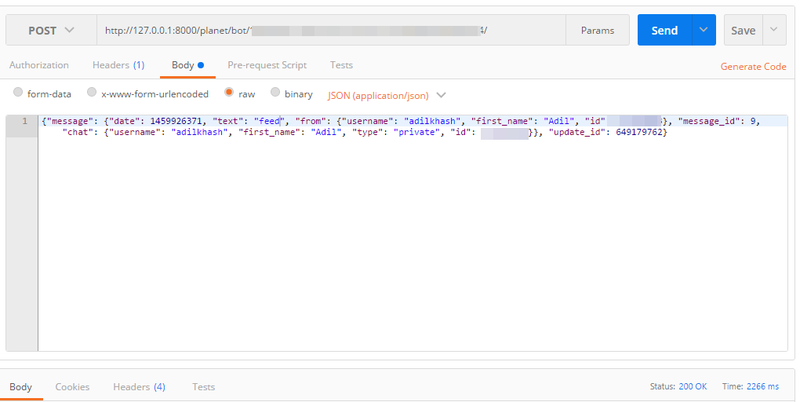 The next step is going to be app deployment and SSL certificate installation to set webhook.